Struggling to figure out how to store all your data, both structured and unstructured, and retain it to adhere to compliance requirements and company policies? 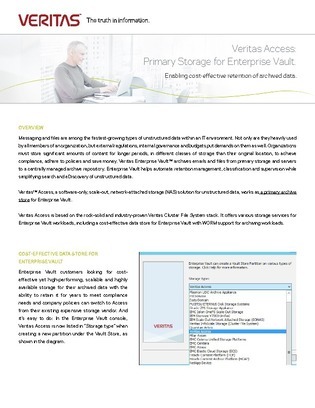 See how to put your struggles behind you, with this brief, “Veritas Access: Primary Storage for Enterprise Vault.” Find out what to look for in a storage solution to easily accommodate existing and emerging archiving needs for all your data. Learn about Veritas Access, a software-one, scale-out, network-attached storage (NAS) that can be used as a primary archive store for Enterprise Vault. See how integrating Veritas Access with Enterprise Vault gives you a scalable, highly available, high-performing end-to-end information archiving solution. Stop struggling - see how easy it can be to store, manage and archive your data to meet all your compliance and business needs.